The Red Carpet Collection unveiled each year at the Cannes Film Festival provides Chopard with a reoccurring opportunity to push beyond the limits of its art while expressing boundless creativity. Since 1998, Chopard has been serving as Official Partner of the Cannes Film Festival, annually showcasing the quintessence of glamour through this creative and passionate cooperation. The Red Carpet collection resulting from this special partnership was introduced in 2007 to mark the 60th anniversary of the festival. Intended to adorn stars for their red carpet appearances, the creations stem from the imagination of Chopard Co-President and Creative Director, Caroline Scheufele. Cleverly blending ancestral skills and cutting-edge techniques, they take shape through a fascinating synergy between the various talents exercised within the House. Every year since 2007, Chopard Co-President and Creative Director Caroline Scheufele has been imagining a High Jewelry collection taking up the extraordinary challenge of releasing a number of jewelry models equivalent to the edition number of the Festival. Stemming from her boundless imagination and from the peerless mastery of diverse skills within the Chopard workshops, a complete collection of 71 creations will be rolled out this year, dedicated to the world’s greatest actresses for their red carpet appearances. This year, the Red Carpet Collection is inspired by the many travels and dreams of its creator. Year in and year out – like the members of her family who used to crisscross the globe with trunks full of precious merchandise, journeying as far as the court of the Tsar of Russia – she tirelessly tours the many countries in which the family Maison’s creations are present. These peregrinations are a perpetual source of inspiration for Caroline Scheufele, who jots down and sketches her impressions in her travel diaries. With the Red Carpet Collection, she invites us into the secret world of her reveries and personal intuitions, offering a delightful, generous and mysterious revelation. She is inspired by anything and everything: architecture, art, literature and cinema. 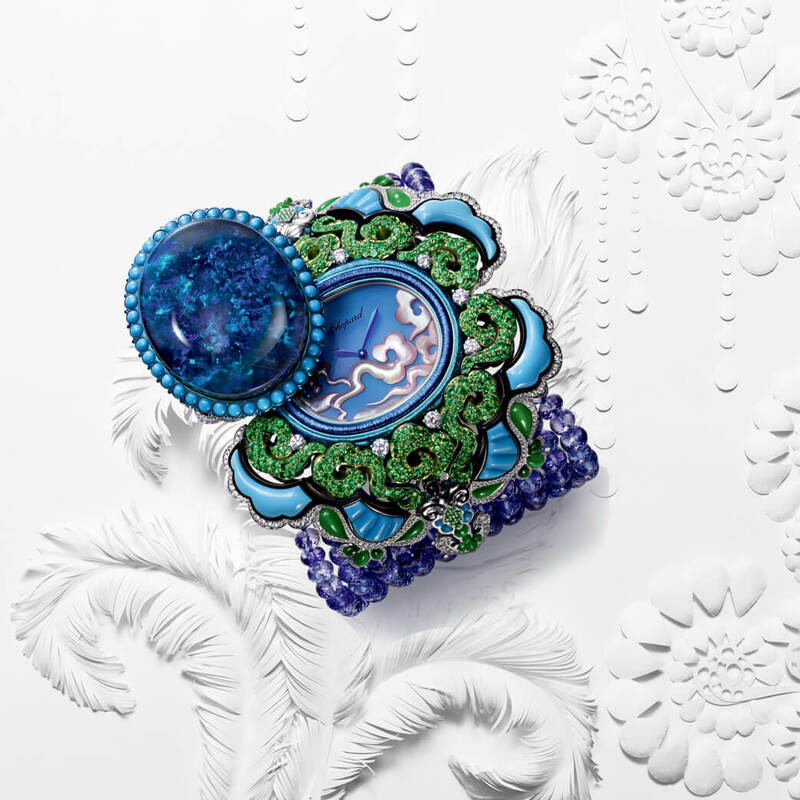 A tiny detail is enough for this fervent gem lover to dream up the most splendid – and above all most ingenious – adornments. Nature also remains a powerful source of fascination for her creative mind.